The fiscal cliff may be a thing of the past, now that the president has signed into law the compromise bill that the Senate and House passed on New Year's Day. 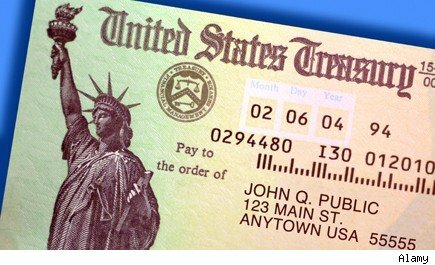 But for as many as two-thirds of all taxpayers, the verdict is still out on whether they'll get their tax refund checks on time. In late December, the IRS said that as many as 100 million taxpayers could face delays in getting their tax refunds if the fiscal cliff weren't resolved before the end of 2012. Unless certain tax-law changes that the IRS was counting on were passed, IRS computers would need to be updated. That reprogramming job could have forced taxpayers to wait until late March before they could even file their returns, let alone expect refunds. The complications were caused by the alternative minimum tax, which was originally intended to prevent the very rich from using loopholes and credits to avoid the tax man altogether. But time and inflation expanded the number of people who fell under the AMT, to the point where an estimated 30 million middle- and upper-middle income taxpayers would have been hit by higher tax bills because of it. In past years, lawmakers had always passed an annual "patch" to the AMT that made inflation adjustments, preventing the tax from applying to those millions of ordinary taxpayers, and the IRS assumed that a similar provision would eventually be passed for 2012. But with the 2012 AMT patch in limbo during the fiscal cliff crisis, tens of millions of taxpayers could have been subject to the tax for the first time. The newly passed law addresses the AMT in a more lasting fashion, making inflation adjustments for 2012, and making future adjustments automatic -- no further action from lawmakers required. That will save those 30 million or so taxpayers from having to pay an average of about $4,000 extra to the IRS this spring. But even now that the fix has been made, the IRS is reluctant to say whether it will be able to avoid a tax refund crisis. Although the IRS has issued new withholding guidance that reflects the provisions of the new law, it says that it's "reviewing the details of this week's tax legislation and assessing what impact it will have on this year's filing season." Because the inflation adjustment in the new law matches what the IRS expected, there's reason to be optimistic that the IRS will be able to process returns as expected. Still, until the IRS says when taxpayers can start filing their returns, there's also reason to fear that refunds could come later this year. Motley Fool contributor Dan Caplinger appreciates getting an AMT break. You can follow him on Twitter @DanCaplinger.